Silverstyle: How Do You Define Success? January 25th will be the one year anniversary of my blog. I started the blogging on a blizzard day and I don't really know why I did other than I was bored. I had no expectations, no game plan and most of all no preconceived notions of what defines a successful blog. Actually, at that time I barely knew what a blog was. This whole idea was pretty off the wall even for me. I'm very unphotogenic, I am not known for my writing skills, and if the truth be told I'm horrible at expressing my feelings and emotions. So what the hell was I thinking? So, the adventure began. At that point I really didn't know about followers, comments, stats or any of the other things that can make you crazy. But more importantly, I have made some great friends. Like Dawn @Suitcase Vignettes who could actually be my long lost sister (if I ever had one) and Debbie @ She Accessorizes Well that has the most beautiful jewelry, and is brave enough to put herself out there in real life, and Pam @ Over 50 Feeling 40 who is teaching me how to write a better story, and Paula @ Fashion Over Fifty who just makes me smile every time I open her page, and Mongs @ My Thrifty Closet who has encouraged me and supported me. 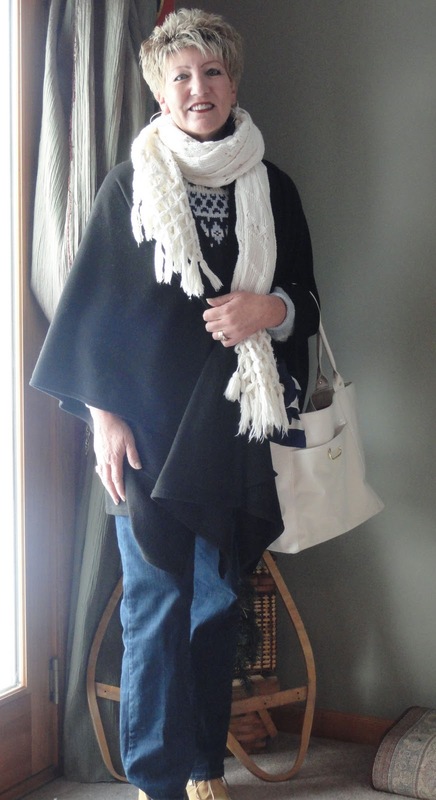 And Patti @ Not Dead Yet Style that reminds us all that over 50 is a fun, elegant and classy phase of life. And Dawn @ Spunky Chateau that has a heart felt thrifting need as big as mine and Emily @ Tinfoil Tiaras that has such a sweet outlook and has shown me that Canadians are really no different than Americans (Don't tell her I said that!). What I'm trying to say is to me blogging isn't about the stats. It's about the friends the journey brings. So take a minute and stop by to visit my friends and show some bloggy love! This is what I wore shopping yesterday. A little retail and thrifting made my day wonderful. Yep, still haven't worn a "proper" coat! oH YOU radical u with the no coat thing, and the white bag! Love it! Thanks for the shout out and I feel the same way. Its all about the friendships! To me, something is successful if it brings you joy and it sounds like you have much success! Because friends bring us all so much joy! I am honored to be mentioned in your list! BTW....I love this scarf!! It's beautiful...happy blogoversary early!! 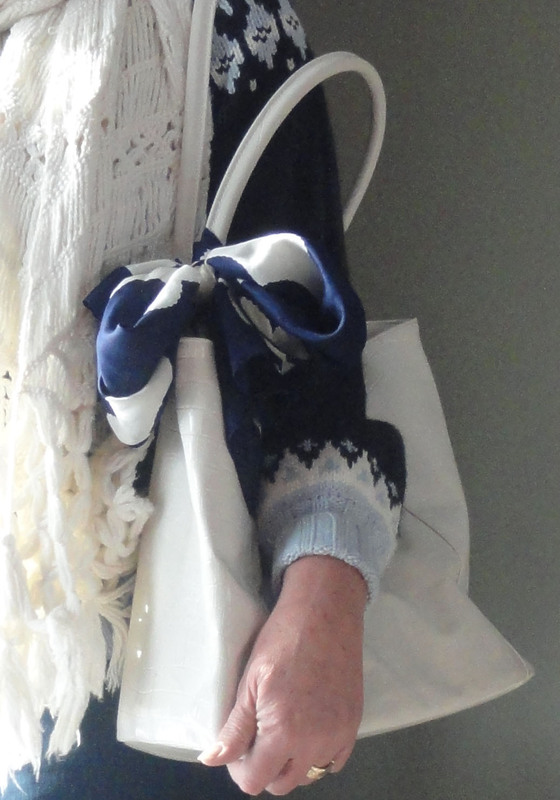 The winter white scarf and handbag are very pretty. Nice touch with the scarf bow. So many fashion ideas I have yet to try. I'm not a "good" blogger, but it has been fun and a nice little hobby that I've enjoyed. And little did I know I would meet such a nice and supportive group of ladies in the process. Has it been a year? congrats and you're correct, it IS the friendships that matter. You are so right, my dear frine. I am so glad to be in your blogroll, that is like being in your life and heart. I am honored and very lucky to know you. Thank you for the mention. Looking forward to another year of being your bloggy sister. You are an awesome blog friend and it is a pleasure to know. You look so put together and classy even if it is just for retail therapy. 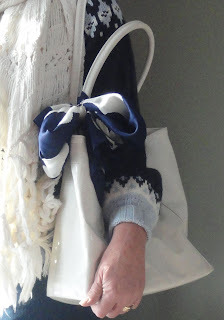 Lots of love Tammy, Dawn Suitcase Vignettes xo I love white in the winter! First I want to say that you are photogenic. If you aren't, you could've fooled me. You always look perfect and this outfit is no exception! Thank you for your sweet mention! I am so glad to 'know' you too. I was just telling a friend yesterday about how I enjoy blogging because of the women I communicate with every day. I would like you to know that you are one of the bloggers who inspired me to start blogging. We have just begun this journey. I can hardly wait to see where it takes us in the future. I don't agree with the unphotogenic thing- you always loook lovely. I always thought I was unphotogenic for years and years and years and then blogging showed me, it's just about knowing when the picture is being taken!!! !That's a lovely tribute to your blogger friends! what a great outfit. 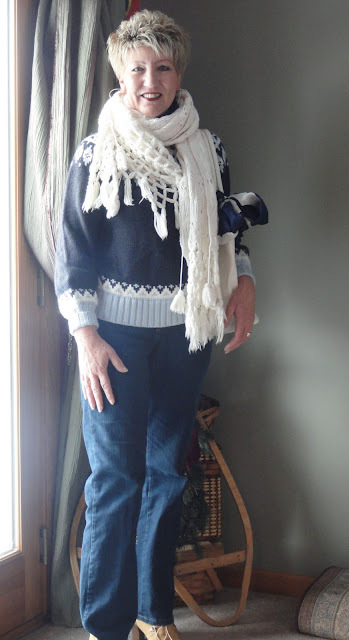 the sweater is fab and i'm loving the shawl and scarf too! Happy Blog Anniversary! i think that's so exciting that you've been keeping up with this blog for a year now. and it is wonderful to make blog friends. Happy anniversary dear friend! It's not difficult to be your follower, you're such a sunshine - always so sweet, funny and unpretentious. Yes ...people blog for different reasons. The best part about blogging is getting to know wonderful friends especially friends like you! You're one stylish lady my dear, totally photogenic.